Hamas Fuli shangwe wakisherehekea miaka 25 tangia chama kianzishwe! 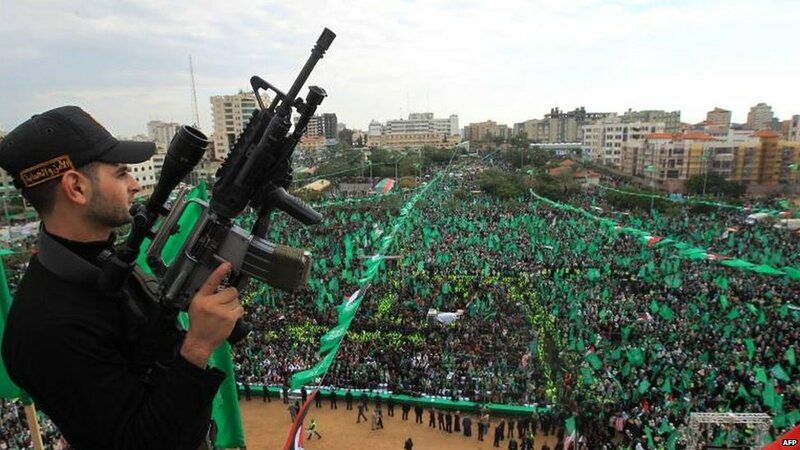 Tens of thousands of people have gathered to attend a rally in the Gaza Strip to mark the 25th anniversary of the Palestinian Islamist group Hamas.Hamas political leader Khaled Meshaal gave a fiery speech during his first ever visit to the territory. He said he would never recognise Israel, and insisted Palestinians would never cede any part of their land. Mr Meshaal's visit follows a ceasefire that ended days of violence between Israel and Hamas last month.Later he is expected to unveil a strategy for Hamas and talk of reconciliation with its rival, Fatah. 'Made in Gaza' The BBC's Yolande Knell in Gaza City says the event is intended to send a message that, after 25 years, Hamas is a force to be reckoned with. Tens of thousands of Gazans have made their way to the rally at the al-Qatiba complex west of Gaza City to hear the speech by Mr Meshaal. 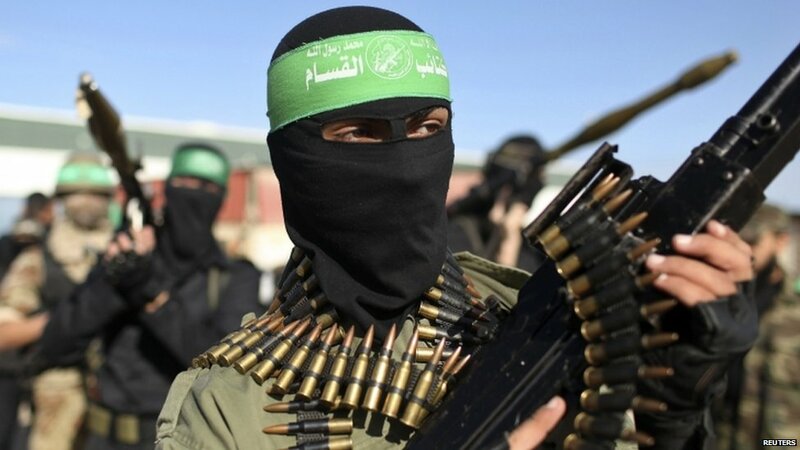 Ahead of that, a masked spokesman for Hamas's military wing, the Ezzedine al-Qassam Brigades, told the crowd: "We will cut the hand that extends in aggression against our people and leaders." 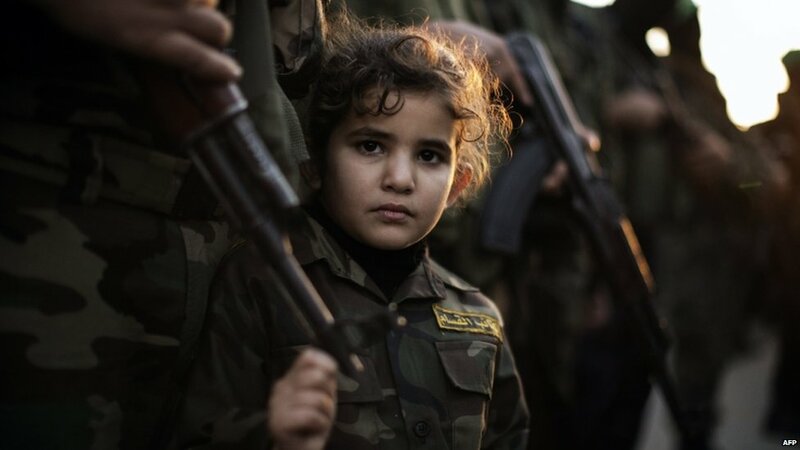 "Palestine is ours from the river to the sea and from the south to the north. There will be no concession on an inch of the land," he told his supporters. 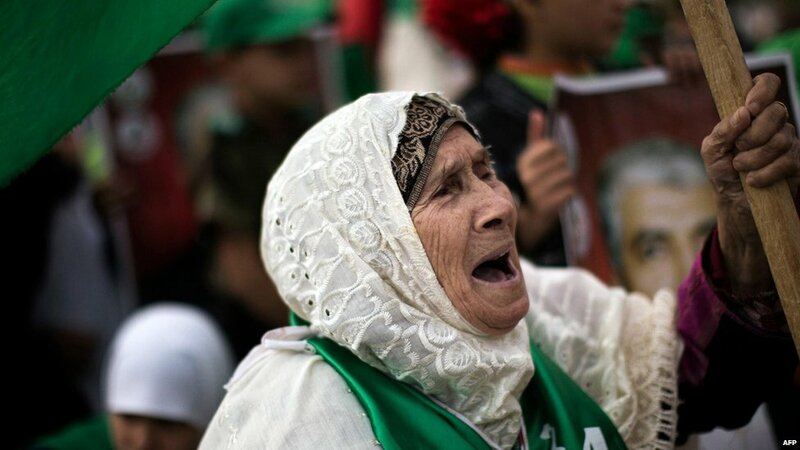 "We will never recognise the legitimacy of the Israeli occupation and therefore there is no legitimacy for Israel." In 2011, Mr Meshaal and Palestinian Authority President Mahmoud Abbas - the Fatah leader - endorsed an Egyptian plan to reconcile the rival factions and our correspondent says there may be announcements of significant steps to move the process forward. But she says it is unlikely such a rally will hear any signs of moderation in the strategy towards Israel. 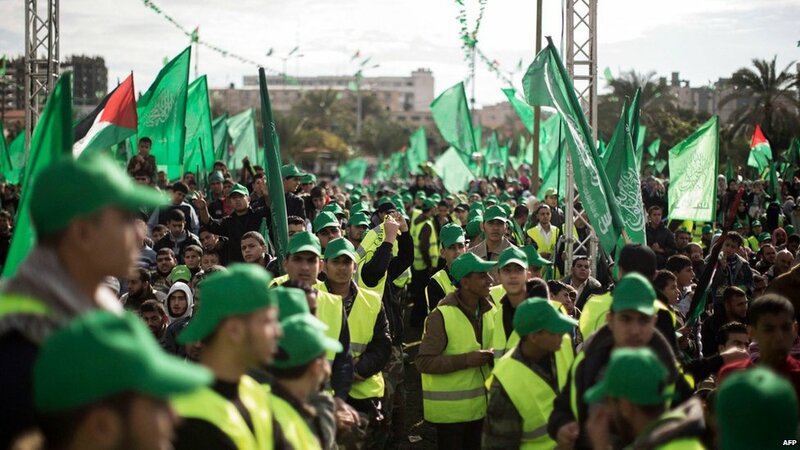 The centrepiece of Saturday's rally in Gaza City is a huge replica of a type of rocket Hamas militants fired at Jerusalem and Tel Aviv in the conflict with Israel last month. It has Made in Gaza written on it. Some 170 Palestinians and six Israelis were killed in the eight-day engagement and Hamas has presented Saturday's event as a victory rally. Ahmed Shaheen, attending the rally with his children, told Reuters: "This is a day of victory. 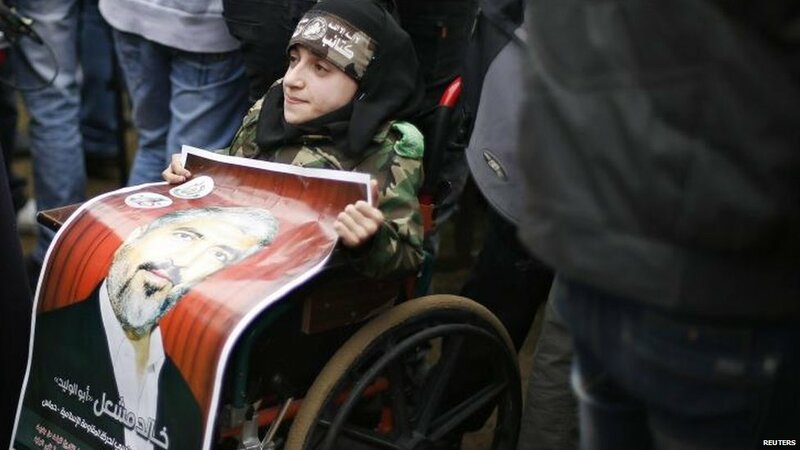 The presence of Khaled Meshaal is a sign of this victory." 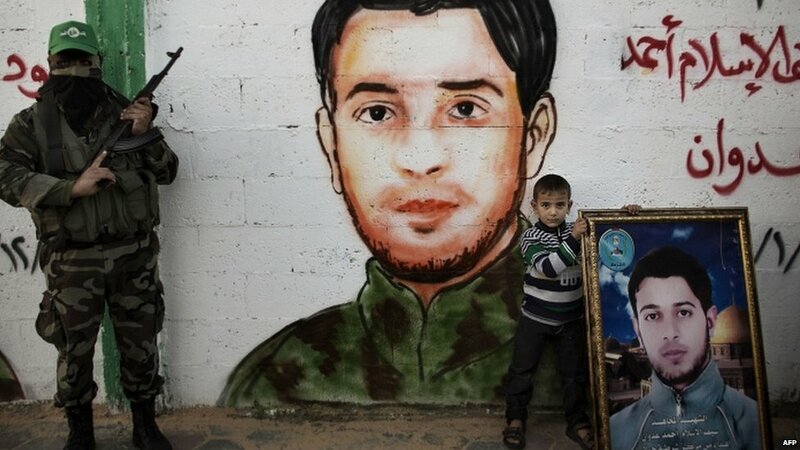 Huge portraits of Hamas founder Sheikh Ahmed Yassin and Ahmed Jabari, the military commander assassinated in an Israeli strike on 14 November, framed the stage. Israel says its operation was successful in killing Jabari and significantly reducing the militants' stockpile of rockets. 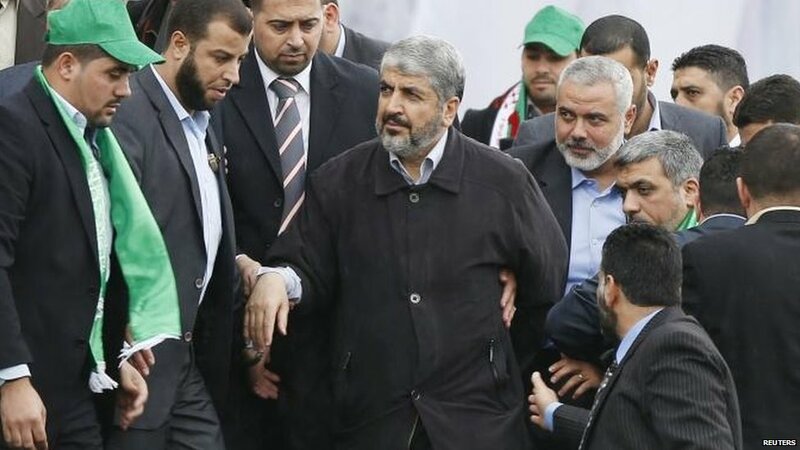 In terms of the Hamas leadership, Mr Meshaal said in January he did not wish to stand again as political chief and the future make-up at the top remains unclear. Mr Meshaal entered Gaza from Egypt at the Rafah border crossing on Friday, touching his head to the ground in celebration. 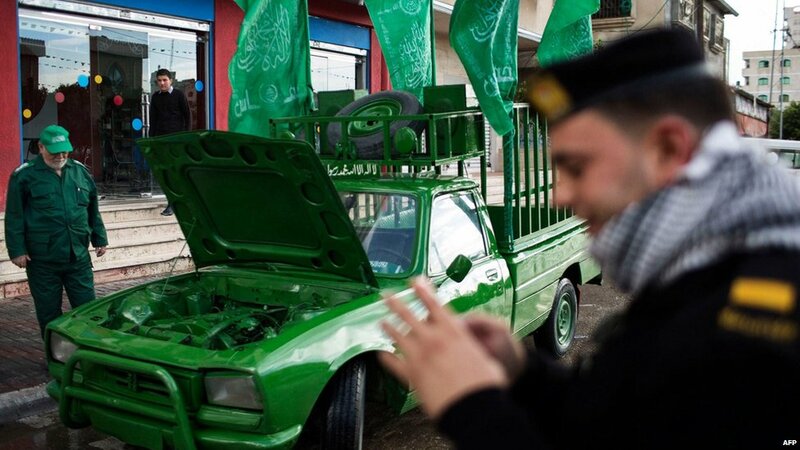 The streets of Gaza City were decorated with Palestinian and Hamas flags. 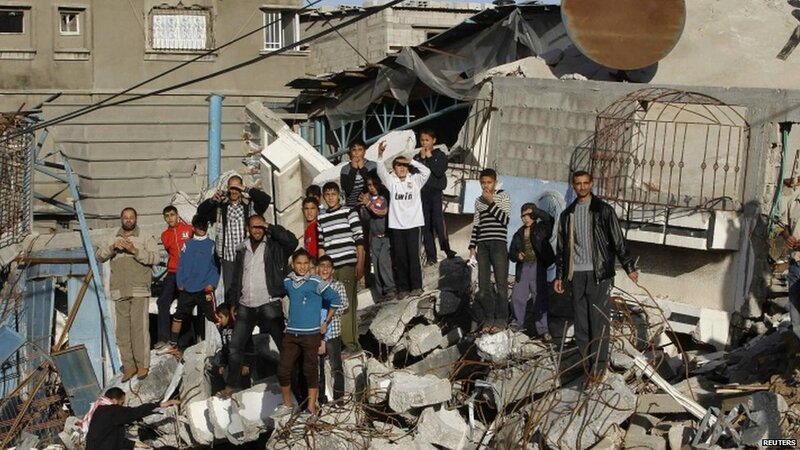 Standing in the ruins of a house destroyed in an Israeli air strike, he said: "With God's will... reconciliation will be achieved. National unity is at hand." Apart from a brief visit to the West Bank in 1975, Mr Meshaal had not visited the Palestinian territories since his family left in 1967. An Israeli official told the BBC that no guarantees for Mr Meshaal's safety in Gaza had been requested and none had been given. Tens of thousands of supporters gathered for an event presented as a victory day, following an eight-day conflict with Israel last month. Many had gathered for a speech by Hamas political chief Khaled Meshaal, who has been making his first ever visit to Gaza. Mr Meshaal (C) has not set foot on Palestinian lands since leaving the West Bank aged 11, 45 years ago. Khaled Meshaal, the political leader of Hamas, has visited Gaza for the first time, entering through the Rafah border crossing with Egypt. Crowds of Palestinians thronged to see the exiled leader, who has not set foot in the Palestinian territories for decades. 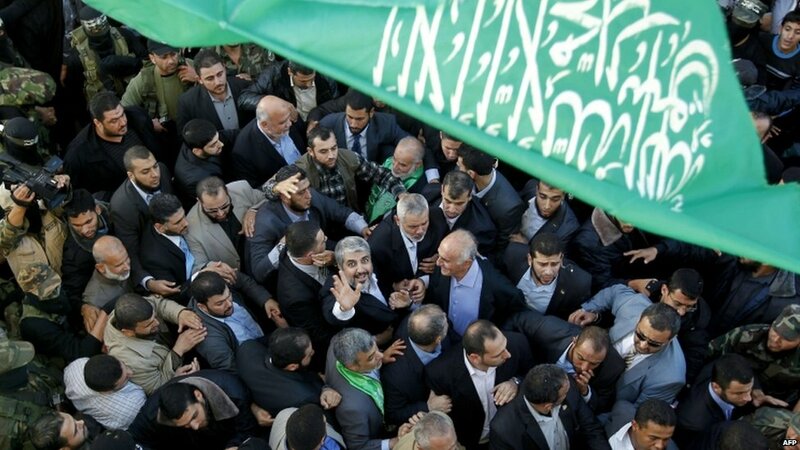 Khaled Meshaal called his first visit to the Gaza Strip his "third birth". His previous two "births" were the day he survived an assassination attempt by Israeli agents in Jordan in 1997 and his actual birth in the West Bank in 1956. He was joined by Ismail Haniyeh, who leads Hamas in Gaza. 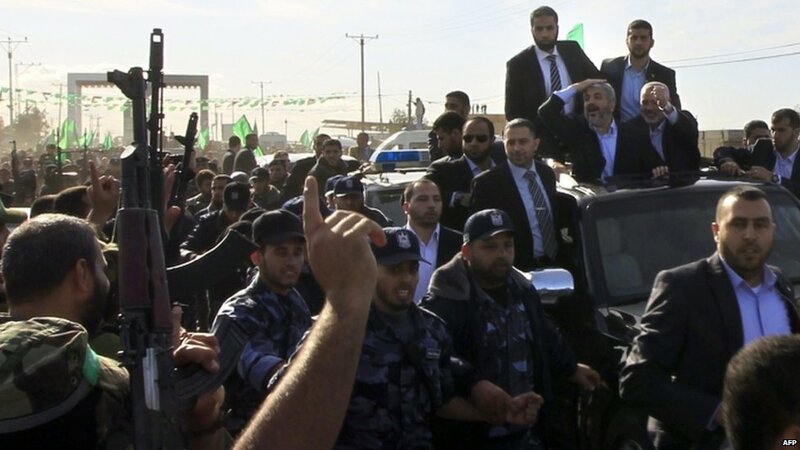 Mr Meshaal's visit follows a ceasefire that ended days of violence between Israel and Hamas. 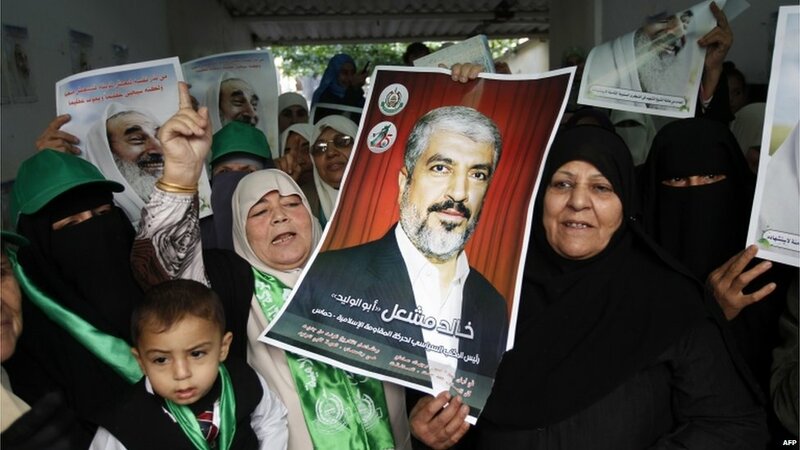 Mr Meshaal is expected to visit the homes of late Hamas founder Sheikh Ahmed Yassin and Ahmed Jabari, the military commander killed in an Israeli strike last month. 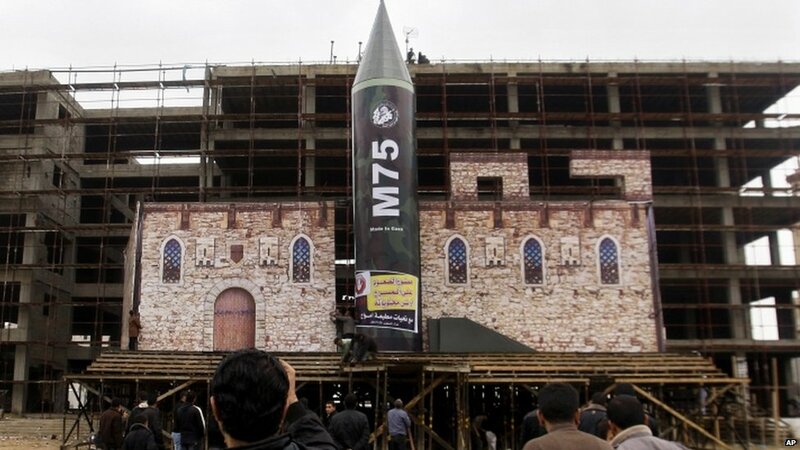 A large stage has been erected in Gaza City - including a model of an M75 long-range rocket - for Mr Meshaal to address what is expected to be a big rally. What a diabolic way to celebrate with guns in front of Children. I don't know what are they teaching these minors.